We are an international accounting team based in the U.S that specializes in assisting foreign parties with managing and accounting for their U.S. real estate investments portfolios. Our goal is to ensure smooth reporting facilitation to all interested parties in the accounting standard specific to their needs. Additionally, we consider ourselves an independent facilitator and document manager between ALL parties involved, including property management, asset managers, tax accountants, auditors, attorneys, investment managers, etc. We are considered the “independent hub” of the team. 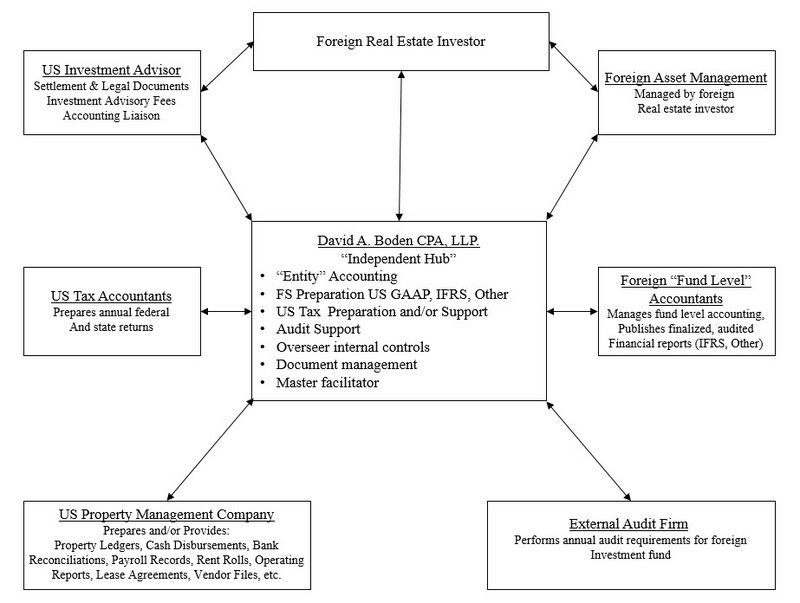 At David Boden, CPA, LLP our focus is to identify what needs to be done and either complete the tasks ourselves or ensure they are done in a timely manner. We consider ourselves the “Independent Hub” of the operation. Because we understand the processes behind US accounting procedures, international accounting procedures, US real estate operations and investment procedures, US tax regulations, and more, we are able to be an “independent hub” for all activity. Thus shortening audit times and costs, creating efficient and timely processes for document management and facilitation, etc. Essentially taking the frustration and confusion away from all parties involved as they know to just contact the hub and they’ll know what to do!